Hey y’all…it’s Amanda from Imperfectly Beautiful. I’m so glad you’re here. Let’s dish about the power of paint, shall we? It is amazing what a fresh coat of paint on the walls, a new light fixture, and some pretty accessories can do for a drab space. 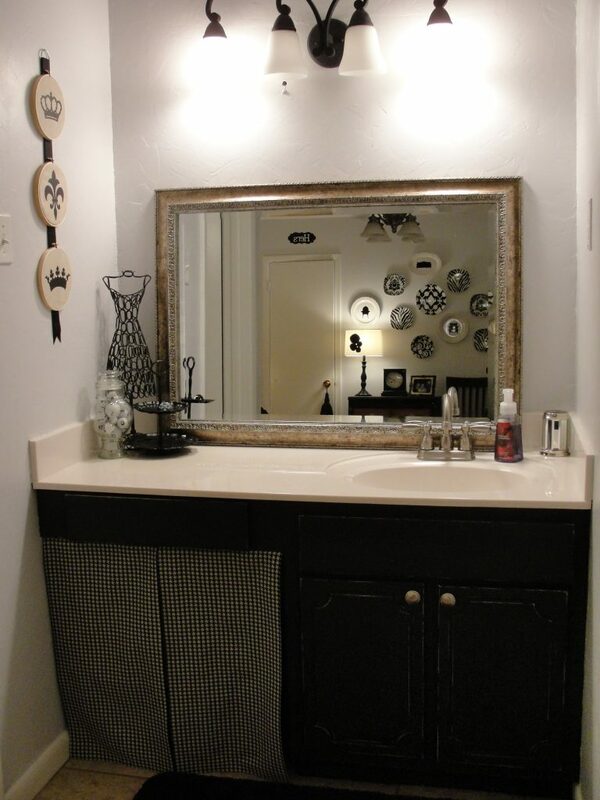 I took my builder basic ugly little bathroom from so NOT pretty, to beautifully chic. And I did it all on a shoestring budget. The only thing I purchased was an $8 piece of fabric and a $50 light fixture from Overstock. The paint I won through a giveaway. Everything else was shopped from around the house and repurposed. Ouch……….I had almost forgotten how unbelievably hideous this bathroom was! The walls had this thick nasty texture on them that was the color of old mud. Oh and let’s not forget the beautiful hollywood lights. Pretty much anything would be an improvement to this space. I started by giving the walls a good sanding with my power sander to take the edge off the harsh texture. Then I added a bright, fresh coat of paint. That alone made ALL the difference. But I decided to kick it up a notch. I used this distressing kit from Country Living’s new line called Caroumal Colours. It is a three step process which includes a basecoat, sanding in between, and then toner. This product requires no pre-sanding of your surface and will adhere to anything…wood, metal , plastic, glass, glossy paint surfaces, etc. I was skeptical about this, but it worked. It was definitely a different painting experience for me. The texture of the paint is like pudding…very thick and not like anything I’ve ever used. The directions actually say to glop it on and mush it around…yes, very technical….just like me. I like it already! You really can’t mess it up. And you don’t have to worry about brush strokes or uneven paint, because you will sand down the whole thing in your next step. After sanding the entire surface, you will then apply the toner. You just brush it on, then wipe it back off with a dry cloth. You can see in the picture above that the left side has one coat of toner, whereas the right side is the sanded surface alone. Once you apply the toner, it takes on a whole new look. The manufacturer’s instructions say this step will reveal your very own distressing story. I love that! I added a fabric skirt to cover the hole under the vanity that I HATE. Now it looks more finished and much more updated. I shopped the house for accessories and found some cute stuff I’d forgotten about. That really is the best part of shopping the house, you know! It’s like getting brand new stuff when you stumble upon things you haven’t seen or used in a while. I am loving how it all turned out. I feel like I have a new room in my house. I’m waiting for my new round mirror to arrive, then it will be complete. Oh……and regardless of how this picture appears, I promise that the vanity is regular counter height. I think because the mirror is propped instead of hung on the wall, the scale is off. This picture makes it look like it was built for people who are two feet tall. We are in fact……not two feet tall, I promise! Don’t forget to link up those paint projects next week…are you ready??? – plus you don’t have to conform to pre-exisiting template page layouts. Gorgeous! You always come up with something amazing!! I love how it turned out. 🙂 My paint project for next week is actually sitting outside drying right now! I’ve been wanting that same exact light fixture from Overstock for my bathroom!! After seeing it in yours, it’s definitely the one I want. Love it!! turned out awsome! and that light fixture fab! where oh where did you find it?! It turned out so well! I love the treatment used for the cabinets! Amanda! That is amazing. Your bathroom is so cute. I love that cabinet — and every single thing about your bathroom is darling! LOVE it, girl! Beeeautiful makeover! Love how the cabinets turned out. What a great product! And that light fixture is fabulous. WOW, that a transformation. I am still always amazed at the power of paint.